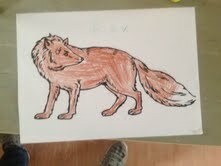 We learned all about the fox. The foxes home is called a den. The fox eats rabbits, frogs, chickens, mice. We think the gingerbread man had a close escape from the fox!! !